This photo of a wedding in Longworth, believed to have been taken between 1940 and 1950, was sent by a member of the Luckett family who asks if anyone can identify whose wedding it was, or any of the guests. Edgar and Winifred Luckett are at the back right, and between them is Betty Chambers. Second from the left standing is Lizzie Luckett. If you are able to identify any of the others in this photo, please contact webmaster@longworthvillage.org.uk. Location is Appleton Road, Barn Ground. 2nd from left top row is Lizzie Luckett’s husband William Luckett, They were Betty Chambers’ parents. Front row right kneeling is Neville Brookes. 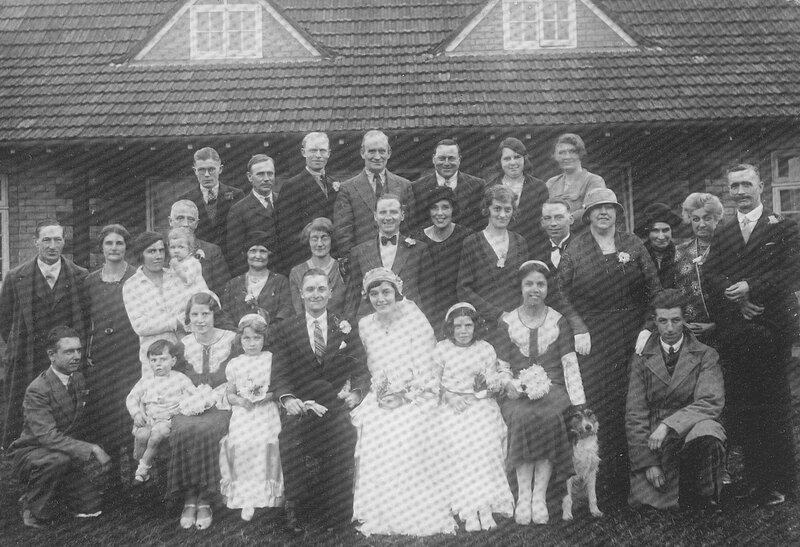 The little lady 3rd from right middle row with hat on… lived at Barn Ground. Dora Eldridge or Nancy Rivers?? I have the original photo of this wedding. It belonged to Betty Chambers. “Bertha Ludlow’s Wedding” about 1932.